How to Download Facebook Photo Albums on iPhone, Most of readers asked me this question so many times. So today here we will discuss how you can easily download all you Facebook photos to iPhone 4. For this you have to try FB Photos Download iPhone app. Which help you to download hundreds of photos with just one click. 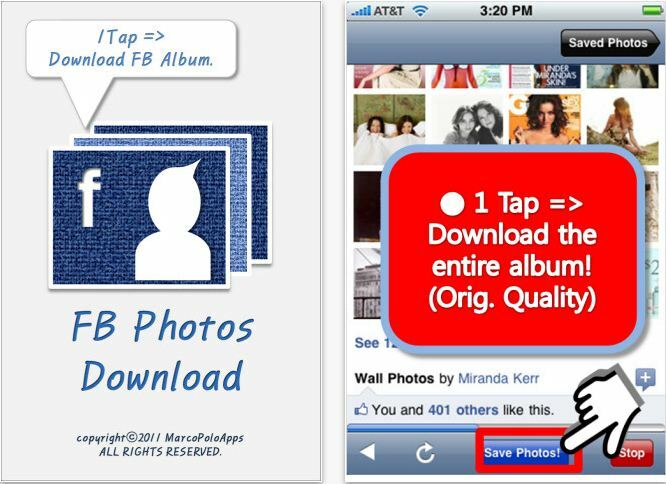 FB Photos Download is compatible with iPhone, iPod touch and iPad. Requires firmware version 4.0 or higher, it available for just $0.99 for a limited time. 1. Download hundreds of photos with just one touch! :- With a single touch, you can download hundreds of pictures of the entire album. (photo album, profile photo, photos in stream etc.) In Offline (without network) => You can enjoy photos in offline, especially this is good for iPod user! 2. Download the original image quality! :- Enjoy the quality of high-resolution photos. 3. Built-in folder(album). :- You can store photos downloaded in in-app folders(albums).